Skyline Dinner Cruise on the Gateway Arch Riverboats. Enjoy live Dixieland band, the scenic views of the St. Louis riverfront and a delicious buffet dinner. Reservations are required. See website to purchase tickets and for any up-to-date information. The St. Louis riverfront offers two 19th-century replica steamboats, the Tom Sawyer and the Becky Thatcher, for cruising the Mississippi River. A variety of cruises are offered: sightseeing cruises, entertainment cruises, Sunday Brunch Cruises, and cruises that feature dinner and entertainment and more. 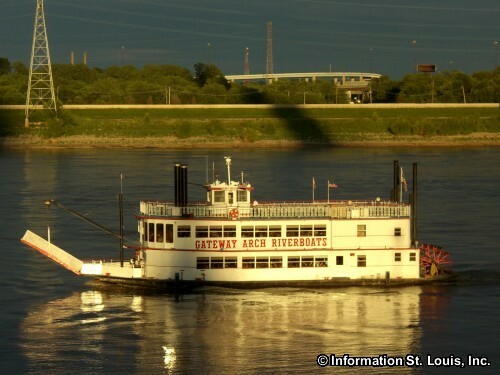 The Gateway Arch Riverboats can be chartered for a special occasion, such as a wedding, reunion or birthday party. Cruises run April through October, plus special Holiday Cruises. Directions: The Gateway Arch Riverboats are located below the south leg of the Gateway Arch on Leonor K. Sullivan Boulevard. Parking is available on the levee in front of the boats. When approaching from the south, use Chouteau Avenue to access this parking area.